OPEN HOUSE SAT FEB 23RD 2-4PM. NORTHWEST ALLEN COUNTY SCHOOLS! Home sits on a large lot in the popular Windsor Woods addition. A spacious foyer welcomes you into the home. Main floor of the home features a great room with a floor to ceiliing brick, woodburning fireplace, built-in cabinets and shelving on either side and a vaulted ceiling with skylights allowing in more natural lighting. Formal living and dining rooms are both very nice size and provide a lot of flexible living space. The kitchen has plenty of storage with solid wood cabinets and a pantry closet. There is a newer stainless gas range & refrigerator. The breakfast area and kitchen are open to the great room. 4 bedrooms are up as well as 2 full bathrooms. There are double sinks and tiled floors in both the hall and the master suite bath. The master has a huge walk-in closet. One bedroom is extra large and could accomodate a multiple person sleeping arrangement or activity space. There is a finished partial basement with another large living/rec area and wet bar area with an 11 foot bar! A fabulous entertianing space ready for all your friends! 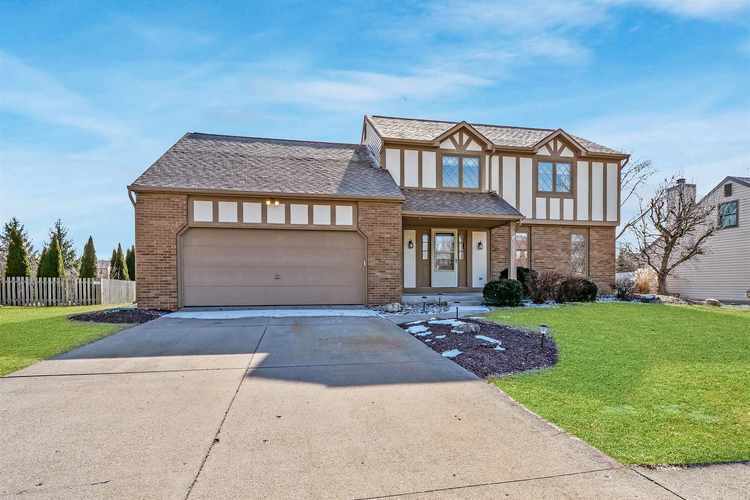 Additional features include, 6 panel oak doors, wood trim, crown molding in the entry, LR and DR., new carpet on stairs and the upper floor, Levelor, honeycomb blinds at many windows and a 12x20 concrete patio & large backyard. HSA Home Warranty included. Near schools, shopping, restaurants, library, YMCA and more! Directions:Lima Rd to Winnsboro Pass then right onto Windsor Woods Blvd. OR Dupont Rd. to Radbourne Dr. then left onto Windsor Woods Blvd.